Something really unique is going on 21st of July in Amsterdam. Then you won’t need to take any ferry over to Noord part of Amsterdam anymore. From that date, you can take the Metro of Amsterdam there! Check out also our Amsterdam Transit article here. This opening is a huge achievement, by those which have built Line 52 which will have a huge opening ceremony on 21st of July. Then on 22nd of July, Line 52 will be in regular service. Fantastic news! So. From 21st of July, you can cross the IJ river environmentally by taking the Metro of Amsterdam Line 52 from Centraal Station to Noorderpark or Noord station. It will be a start of a totally new lifestyle in Amsterdam for sure. Also including the IJ river crossing. Line 52 will continue south in a tunnel all the way to the new Europaplein station, where it see the daylight and meets Line 51 and Line 54 which are both also a part of the Amsterdam Metro system. Including Noord, Noorderpark and Centraal Station. Line 52 will also stop at Rokin, Vijzelgracht, De Pijp and Europaplein. 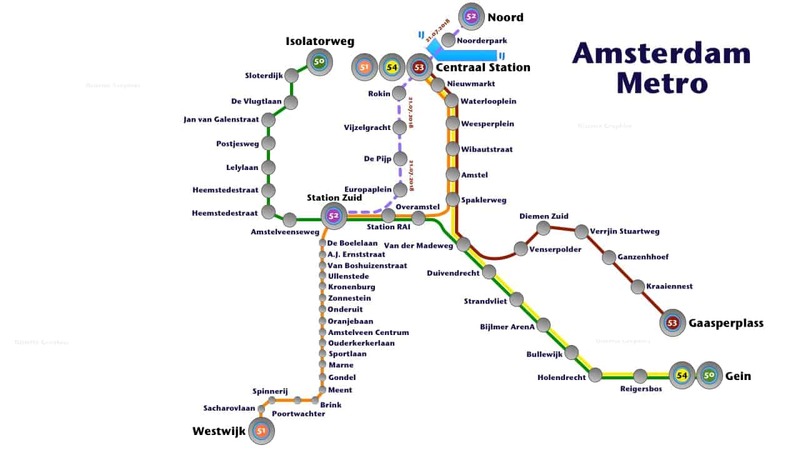 All of them are underground except for Station Zuid where Line 52 meets the other lines. Also at Centraal Station, Line 52 will meet Line 51, Line 53 and Line 54. So, from 21st of July. Amsterdam Centraal Amsterdam Metro station which is already underground. Will also then have another level beneath Line 51, Line 53 and Line 54. We at Distrita hope that our map above can guide and help you once 21st of July comes. Also, including having a great Metro in Amsterdam. The city also boost a huge tram network too. Line 52 that will run between North and South will run on July 22 and to celebrate that we will organize a party the day before, on July 21st. That day everyone can drive for free with the new metro between 14.00 (2pm) and 21.00 (9pm). Well that is worth it in itself, but to give the day an extra touch, all sorts of festivities will take place along the line in those hours. Not only in the stations do various acts occur for you; Various festivities also take place around the stations in Amsterdam. So, below you will find the program around station Noord on 21st of July 2018. The festivities are organized from 14.00 (2pm) to 18.00 (6pm). With free ride of the metro continuing until 21.00 (9pm). From North Station, guided by Adri Doorneveld will give a guided tour through ‘Landelijk Noord’ every hour, by bike, from 14.30 (2.30 pm). This is the area north of the ring road A10, which consists of a beautiful peat meadow area and the villages Zunderdorp, Ransdorp, Holysloot and Durgerdam. If you cycle or walk here, you can enjoy the Dutch skies, the swans that quietly eat in the fields between the sheep and the peace and quiet of the vast polder landscape. You almost do not understand that this is also Amsterdam. This city got way more to offer than the canals and the city itself! Bike ride is for up to 20 people. The first bike ride at 14.30 (2.30 pm), while the last bike ride is at 17.30 (5.30 pm). Bikes are provided by NDSM bikes. You can register via this link and the bike tours are free. The area around the brand new station Noord is being transformed into a new urban center, with approximately 6,000 homes and various facilities. Here you find work locations, catering, a hotel, an exhibition center and a cinema. Noord becomes a place to live, work, shop and relax. The municipality’s project team is present to tell you everything about the development of the station area, but also the neighboring projects such as the Buikslotermeerplein, Elzenhagen Zuid, Noorderkwartier. There are also models of Elzenhagen South and the station area on display. Every hour a tour starts for a maximum of 20 people. The collection point is at the information window of the municipality near the entrance of station Noord. Registration is not necessary for these tours and is free to join also. For more information about whats going on. Please visit amsterdam.nl for further information. The site is totally in Dutch, so we hope that this article helps a bit. 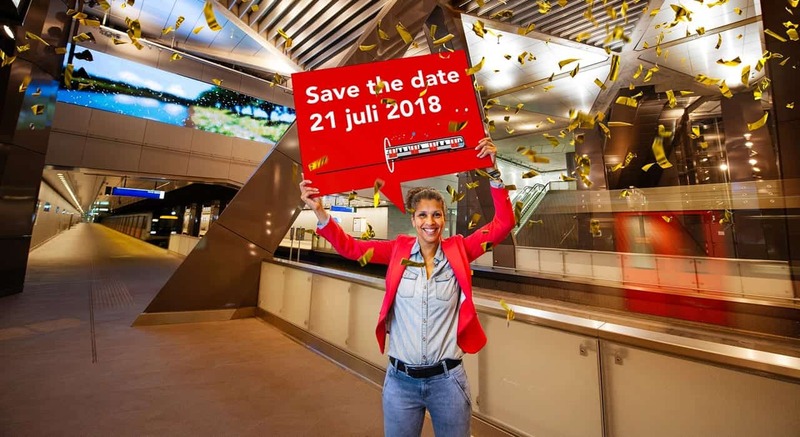 It will be fun to see this new Metro of Amsterdam section opens up on 21st of July. Many have been waiting for this day. Just to think of it how they made this tunnel under the canals in Amsterdam, is an huge achievement.